The results of scientific tests using replicas of two ancient Egyptian artificial toes, including one that was found on the foot of a mummy, suggest that they're likely to be the world's first prosthetic body parts. The University of Manchester researcher Dr Jacky Finch wanted to find out if a three part wood and leather toe dating from between 950 to 710 BC found on a female mummy buried near Luxor in Egypt, and the Greville Chester artificial toe from before 600 BC and made of cartonnage (a sort of papier maché mixture made using linen, glue and plaster), could be used as practical tools to help their owners to walk. Both display significant signs of wear and their design features also suggest they may have been more than cosmetic additions. Dr Finch says: "Several experts have examined these objects and had suggested that they were the earliest prosthetic devices in existence. There are many instances of the ancient Egyptians creating false body parts for burial but the wear plus their design both suggest they were used by people to help them to walk. To try to prove this has been a complex and challenging process involving experts in not only Egyptian burial practices but also in prosthetic design and in computerized gait assessment." Dr Finch, who is based in the Faculty of Life Sciences' KNH Centre for Biomedical Egyptology, recruited two volunteers who were both missing their right big toe. Design replicas of the ancient toes were made to fit each volunteer along with replica leather ancient Egyptian style sandals. The tests were carried out at the Gait Laboratory at Salford University's Centre for Rehabilitation and Human Performance Research. Each volunteer was asked to walk on a 10 metre walkway bare foot, in their own shoes and wearing the replicas with and without the sandals. Their movement was tracked using 10 special cameras and the pressure of their footsteps was measured using a special mat. The 10 best walking trials were recorded for each foot, using their normal left foot as the control. It was surprising how well both volunteers were able to walk using these devices although one volunteer performed much better than the other. 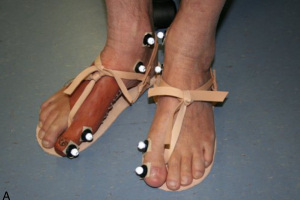 The camera footage revealed that when wearing the sandals with the cartonnage replica, one of the volunteers achieved 87% of the flexion achieved by their normal left toe. The three part wood and leather design producing nearly 78%. Interestingly the ability to push off using the prosthetic toe was not as good when this volunteer wasn't wearing the sandals. The second volunteer was still able to produce between 60-63% flexion wearing the replicas with or without the sandals. Dr Finch says: "The pressure data tells us that it would have been very difficult for an ancient Egyptian missing a big toe to walk normally wearing traditional sandals. They could of course remained bare foot or perhaps have worn some sort of sock or boot over the false toe, but our research suggests that wearing these false toes made walking in a sandal more comfortable." Assessing the volunteers' experience Dr Finch said: "It was very encouraging that both volunteers were able to walk wearing the replicas. Now that we have the gait analysis data and volunteer feedback alongside the obvious signs of wear we can provide a more convincing argument that the original artefacts had some intended prosthetic function. More information: 'Biomechanical Assessment of Two Artificial Big Toe Restorations From Ancient Egypt and Their Significance to the History of Prosthetics' Journal of Prosthetics and Orthotics.